HomeTOEFLAn introduction to the TOEFL LISTENING Section with exercises. August 8, 2018 julia TOEFL Comments Off on An introduction to the TOEFL LISTENING Section with exercises. 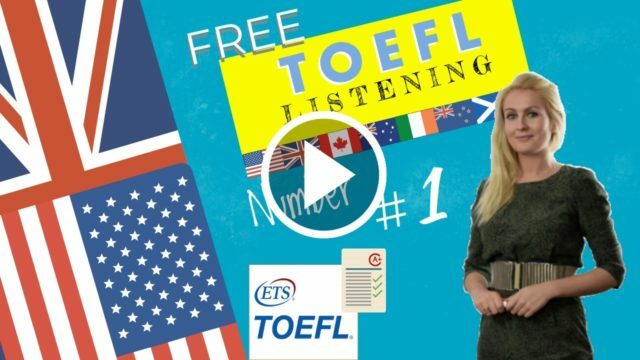 In this lesson you will find a thorough introduction to the TOEFL listening section with exercises to help you prepare. In this lesson we will take you through the TOEFL Listening section of the ibt paper. Here are some directions and prompts: The Listening section measures your ability to understand conversations and lectures in English. In this sample, you will read one conversation and one lecture and answer questions after each conversation or lecture. The questions typically ask about the main idea and supporting details. Some questions ask about a speaker’s purpose or attitude. Answer the questions based on what is stated or implied by the speakers. Most questions are worth one point. If a question is worth more than one point, it will have special directions that indicate how many points you can receive. In an actual test, you would be able to take notes while you listened and use your notes to help you answer the questions. Your notes would not be scored. (Female student) Oh definitely. I’m sorry I had to miss practice, though. I feel bad about that. (Male coach) Family’s very important. (Male coach) A woman who played here about 20, 25 years ago came through town a few weeks ago and saw a game, and said she wanted to do something for the team, so . . . (Female student) So she’s buying us new jackets? (Male coach) Good idea! I have her address here somewhere. Some Exercises to help you with the Toefl listening section.